During the Wednesday, March 27, 2019, Elk Grove City Council meeting, a resident urged the Elk Grove Police Department to take several pro-active, community-oriented actions. The comments came from Maureen Craft during the public comment section of the meetings. Craft noted the imbroglio in the city of Sacramento following the Stephon Clark case (see comments in the video posted below). 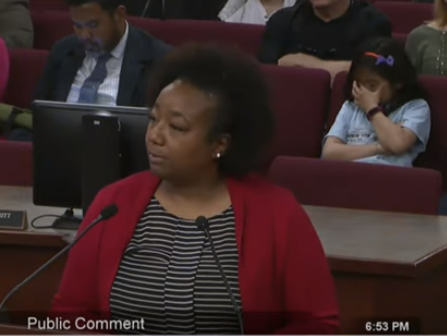 Following several racially-motived incidents in Elk Grove, Craft was chosen as the diversity and human resources expert to represent the city's Ad Hoc Community Diversity Committee. Craft worked alongside Elk Grove Councilmembers Stephanie Nguyen and Pat Hume to be one of the leaders on the city's Evaluation Committee for the Diversity Audit where she reviewed proposals and lent her expertise to select a qualified vendor. In her comments, Craft noted she has engaged Elk Grove Police Chief Bryan Noblett regarding the suggestions and she said he was amenable to additional outreach efforts. The suggestion has not yet been formalized, however.